Best No-Pull Dog Harness 2019 | Making Walks More Fun! Chai's Choice makes the best no-pull dog harness of 2019. It comes with extra padding to prevent any rubbing or chafing and is easily adjustable no matter your dogs proportions. This harness will keep your dog comfortable and safe while discouraging her from pulling. Read more about Chai's Choice Front Range Dog Harness below. What is a No-Pull Dog Harness? Why Use a No-Pull Dog Harness? Why Won’t My Dog Stop Pulling? Now It’s Time for Adventures with Your Dog! You just got home from work and are so excited to take your beloved pup on a walk, but then a sinking feeling hits your gut and you remember...the pulling. Your dog drags you across town or down the street with herculean strength and immense enthusiasm. It’s the one thing that makes your walks not nearly as fun as you would like them to be. This is a fairly common issue that most dog owners face daily. It’s understandable that your dog is wound up and ready for a run after being indoors while you were away at work or out with friends. You want to get that pent up energy out with a nice walk or run, but a dog pulling on the leash is a tough obstacle to overcome. This is a catch twenty-two: your dog needs to get their daily exercise, but their constant pulling will wear you out long before your dog tires! So, how can you get your dog to stop pulling on their leash? The answer: a no-pull dog harness. A no-pull dog harness is designed specifically for a dog that pulls on their leash. The goal is to discourage the dog from pulling. The best no-pull dog harnesses will do this in a way that will not cause discomfort to the dog or human. There are a few ways this works. We will go into greater detail later on about the different types, but the basic concept is to apply pressure in order to redirect the dog. Now, you might be worried that a harness may cause rubbing or irritation to the dog. The reputable companies who design these harnesses keep this in mind, since feedback from early prototypes were quick to bring the issue to their attention. They choose their materials carefully in order to lessen the likeliness of this problem occurring. The most common material used for theses harnesses is a nylon or webbed nylon. Most offer a padded section to provide the dog with extra comfort as well. A high-quality harness will be easily adjustable and allow you to fit it comfortably for your dog. Since every dog is unique, you may need to experiment with different brands to see what material and adjustments work best for your dog. The obvious answer to this question is that no-pull dog harnesses discourage and prevent your dog from dragging you every which way, but the benefits of these harnesses go beyond just stopping an unwanted behavior. Many of the no-pull harnesses can also prevent accidents, reduce risk of injury, and stop your dog from getting loose. A fear that many dog owners face is their dog pulling them to a conflict. This might mean another less-than-friendly dog that prefers to be left alone or maybe charging at a black and white kitty that turns out to be a real life Pepe Le Pew! A no-pull harness will prevent these problems before they even have a chance to occur. Another real threat to both dog and owner is an injury caused by a strong pulling canine. Many owners have had scraped up knees, sprained wrists, bruised arms, or, even worse, falls that lead to ER visits. There’s also much controversy over some collars and harnesses that can possibly injure the dogs themselves. By choosing a no-pull harness that is constructed with the health of both dog and the owner in mind, you can rest assured these risks are minimized. A final dog owner nightmare is the potential danger of their dog pulling away and getting loose. No owner wants their dog to become lost or suffer a serious injury that may occur when they don’t have a hold on them. A no-pull dog harness can work to keep your dog under your control at all times. Finding the right no-pull harness will put your worries at ease by keeping you and your dog safe and happy. Training is key with all aspects of dog ownership, but it’s especially important when it comes to no-pull harnesses. Why? Because it’s easy for your dog to get confused about where the pressure is coming from and how to make it stop. This means if you don’t train them properly with a praise or reward at the correct time, they will try other options to get away from the pressure. This may mean pulling harder, pawing at the harness, or chewing on the leash. Your dog relies on you to tell them this information. You have to make it clear that by not pulling, the pressure stops and they get a reward. Here are a few easy steps you can start with to train your dog not to pull with a no-pull harness. In traditional training, you say “heel” to keep your dog at your side. If your dog begins to get ahead of you, say heel. Your dog does not know what this word means yet, so don’t be surprised when he or she continues forward. Once you feel your dog reach the end of the leash and push into the harness just a bit, use a word that means, “that was a mistake”. This word could be “whoops” or the sound “uh-uh”. Pick a word you will remember and feels right. As you are saying this word, do a U-turn with your dog. The harness will aid in this, as it will naturally point them toward you. Now you have given your dog another chance to be at your side instead of in front of you. Reward them verbally and with some of their favorite treats as they do so. If your dog begins to get ahead again, repeat the exercise. Do not repeat the word “heel.” Repeating words may sound strange to your dog. One firm command word will give them clear direction, it will just take them some time to learn what this command means. You don’t want you dog to learn that a pull and stop means a treat. By changing direction and rewarding at the correct time, you should be able to avoid this. The best part of this method is it teaches your dog the best place is at your side, not pulling in front of you. Stay consistent and work hard to make sure you and your dog understand the right training process for the both of you. Soon you’ll have a dog that leaves a little slack in the leash and looks to you when they encounter a distraction! Now let’s talk more in-depth about the types of no-pull dog harnesses on the market. You already know a bit about what they do, so let’s go into more detail about how these harnesses work. If you have a dog that is a moderate puller, the front clip dog harness is your best choice. 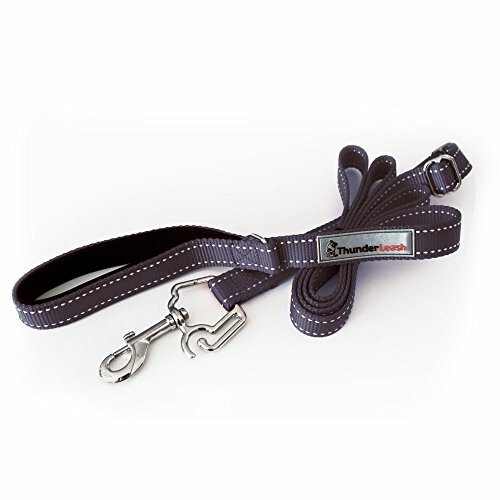 If you have a dog that is a strong puller, the head harness will give you more control. We’ll also help you determine which type will give the best results for your dog. 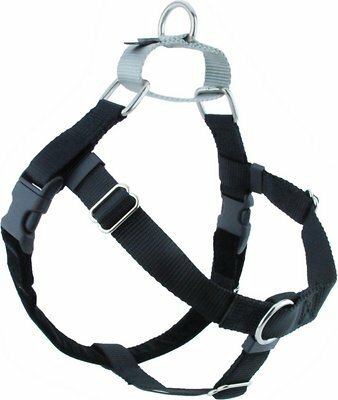 The most common type of no-pull harness is the front. These are great for moderate pullers because of how they are designed. They work by applying pressure to the chest when the dog pulls. When the dog feels this pressure, they have to face you rather than whatever has their attention. This creates a great opportunity for positive reinforcement training. Your dog will learn that looking at you, rather than pulling, is a good choice when you reward him with praise and a treat. The no pull leashes acts as a harness by looping around the belly and applying pressure on this sensitive area when the dog pulls. This is another good choice for moderate pullers because it also allows you to redirect your dog’s attention by gently using pressure. They are not as popular as the front clip no-pull harness, but they are a great option if your dog ignores the pressure applied to the chest. The last type of no-pull dog harness is not something that typically pops into your head when you think of a dog harness. It’s usually referred to as a head harness, head halter, or head collar. These are great for strong pullers. Instead of your dog having a harness to pull against, you’re now able to control their direction. The idea behind this type of design is that where the nose goes, so goes your dog. It simply puts you in charge of the muzzle, so you control where your dog goes. This style of harness can appear intimidating because it looks like the dog is wearing a muzzle. But don’t worry, it is actually very gentle on your dog. It also looks tough to put on. The head harness will take some getting used to for you and your dog, but the benefits are worth it for a dog owner who really needs to control their strong puller. Don’t let their appearance fool you, many owners have fallen in love with this style. 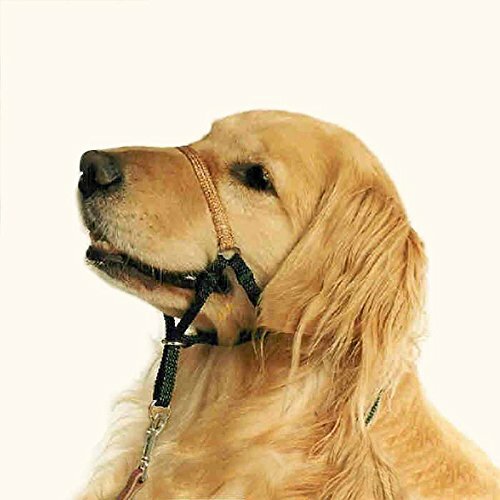 The head halter works by slipping behind the ears and over the muzzle, while the leash attaches below the chin. When the dog goes to pull, pressure is applied to the muzzle. This allows you to redirect them to face you or stand by your side. Once again, it is important to reward your dog when they stop pulling. This solidifies that pressure means to stop pulling. Dog owners who are new to head halters need to give their dog an adjustment period. Dogs are not accustomed to walking like this and will often try to paw off or rub the head halter. A good fix for this is to use treats for a distraction and reward when they are working correctly. Your dog won’t have time to worry about rubbing the halter off because he’ll be too busy focusing on his “job” of walking properly. Now that you know what they are and how they work, let’s take a look at the best no-pull dog harnesses on the market. We’ve picked the top harnesses from each style so you can decide which will work best for you. All of them are highly rated and recommended, each offering unique features. Chai’s Choice takes number one spot because it is one of the highest reviewed no-pull dog harnesses and has some of the best features. It is the most padded and most adjustable harness available. Dog owners love that it doesn’t cause any rubbing or irritation and how simple it is to use. It includes some cool safety features like nylon webbing with reflective material for visibility at night and a sturdy handle for looping a seat belt through. It can also be converted into a regular harness just by snapping the leash to the back instead of the front. They also offer a 30 day money back guarantee if you are not satisfied with it! The Freedom No-Pull Harness is another highly rated choice. If you’re main concern is avoiding abrasive material, the Freedom No-Pull Harness might be for you. The company really targets this point by saying, “The harness has a soft Swiss velvet lining on the strap that goes behind the legs to help prevent rubbing, chaffing and sores that sometimes can be seen with other harness designs.” Another precaution they took when designing this harness was turning all of the edges OUT so they don’t irritate your dog. The company also offers instructions with the harness. And if your dog is a chewer the manufacturer will replace up to two chewed straps for free, with the additional cost of shipping. The PetSafe Easy Walk Harness has a good rating and is the simplest harness offered. This no-pull harness has a belly strap that’s a different color so you can easily identify it and know which strap goes on top and bottom. It has four adjustment points so you can properly fit it for you dog. The company also offers replacements for a low cost if any parts are lost or damaged. This harness doesn’t have a back clip, so it can only be used as a no-pull harness. Although it doesn’t offer as many features as others, it is still a solid choice for training your dog not to pull. If you are worried about the chest strap and think your dog would do better with belly pressure, the Thunderleash is your best option. The Thunderleash is simple to use: attach it to your dog’s collar, wrap it around the torso, and go. It is also the most adjustable since it is a loop rather than straps. It can also serve as a regular leash by just using the snap attachment on the collar. The Instant Trainer Dog leash is a bit different from the Thunderleash. One, it sits back further on the dog’s torso. Two, it can only be used on dogs over 30 lbs. We have put it in the number 2 spot since it can’t be used on small dogs, because as we know, they can pull too! It does work the same by applying pressure to the belly, just further back. If you think your dog would respond better to this than just under the elbows, it might be the better choice for your medium to large dog. 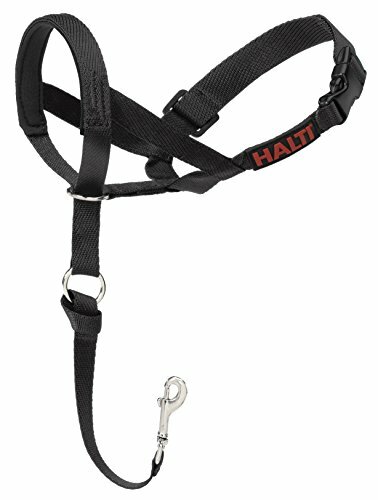 If you have a strong puller and need something that will stop your dog from pulling for good, the Halti Head Collar is a great choice. This collar has been around since 1979 and has brought control to dog owners ever since. It is one of the top rated head halters on the market. It features a safety collar snap for extra security, has soft nylon straps, and when properly fitted, it won’t rub or irritate. 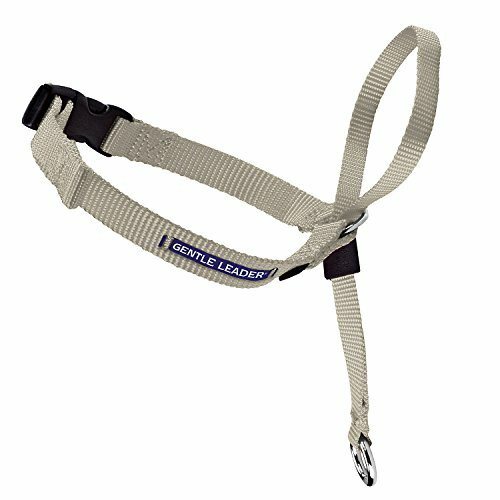 The PetSafe gentle leader Head Collar is another top rated head harness. It comes with a training DVD to help owners and prevent any confusion. The straps are a bit wider than the Halti Head Collar, so some may worry that it could rub. As long as it is properly fitted, this shouldn’t be an issue. 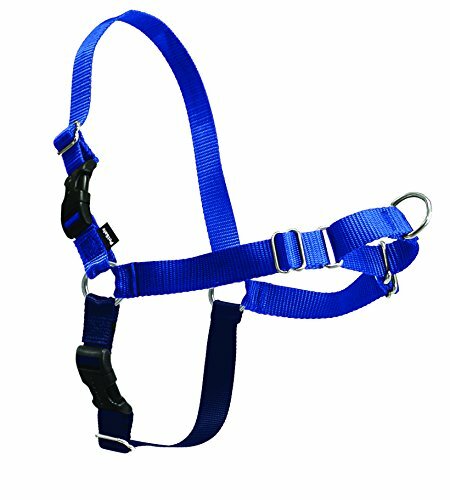 For any of these no-pull harnesses to work, they need to fit properly. A harness that slips or loosens on a walk won’t work. Be sure to carefully read the instructions on how to measure your dog for a harness. Please do not skip over these instructions! The biggest concern you should have after you have chosen your harness is that you get the correct size. If possible, go to a pet store that carries the harness and try it on. Stores tend to have higher prices than online, but you’ll be able to make sure it fits before you get it in the mail. Reviewers are great at giving feedback for fits based on size, breed, and build. Make sure you go through and try to find someone who has a dog that is a similar breed to yours and see if they talk about the size or fit. Another great feature of Amazon is that you can ask questions and other reviewers answer them. Putting on some of these harnesses isn’t easy. If your dog gets excited and squirms, it can be even more difficult. Before you put it on your dog, see if the company or any reviewers have posted how-to videos online. It can be very helpful to watch someone put it on and prevent you from getting frustrated. If you find your dog still pulling after a few walks, you need to check a few things. Is it properly fit? Or does it slip to one side or down? Is it the correct size or does it seem too loose or too tight? If you’re having any of these issues, try different adjustments and check reviews to see if any other owners offer solution. If you’re not having any of these issues, have you been training your dog with your new no-pull harness? This is very important! All of these harnesses are tools, not the final solution. If your dog is still pulling, make sure you are rewarding them when they are not pulling and taking your time to correct them when needed. We all want to have enjoyable walks with our dogs. A walk with a dog that doesn’t pull is exactly how we want to spend time with them. With some work and patience, you and your dog can achieve this. Once your dog is trained with a no-pull harness, you will be able to go to parks, games, and events without having to worry. You can make sure your dog gets plenty of exercise with daily walks. And best of all, you can make sure you both stay safe and comfortable on your adventures! At ReadySetDogs, we are committed to helping you provide the best care for the furrier members of your family. If you have any questions, comments, or concerns, feel free to contact us or leave a comment below.